ConnectCode Barcode Software allows the creation of industry compliant barcodes in iWork Numbers easily using Open Type Barcode Fonts. This tutorial describes the process of creating large number of barcodes in iWork Numbers using AppleScript, Barcode Command and Open Type Fonts from ConnectCode Barcode Software (available on the Mac App Store). The different components required are described in details below. Numbers is a spreadsheet application in the iWork suite developed by Apple Inc. It is a widely used application on the Mac platform and allows users to carry out a wide variety of productivity and number crunching tasks. AppleScript is a powerful and versatile scripting language built into Mac OS X/macOS for automating repetitive tasks. ConnectCode Barcode Software uses computer fonts (Open Type) to create industry compliant barcodes for use on Mac OS X/macOS. Different types of barcodes can be created and easily embedded into any graphics or business document. When a barcode created using a font is printed, it rasters to the resolution of the printer and will not be limited to the Dots per Inch (DPI) of an image. This enables creation and printing of resolution-independent barcodes that meet the strictest industry requirements. The software uses a highly-acclaimed barcode fonts engine developed by ConnectCode. This engine has helped many companies clear their independent barcode verification tests over the years, and is now widely-adopted by many fortune 500 companies. ConnectCode Barcode Command is a command line application/utility for Mac OS X/macOS that generates industry adherence barcodes. Information such as the type of barcode, data, and check digit are specified as input parameters to the command line application. By using the output string of the Barcode Command application with Open Type Barcode Fonts (provided in ConnectCode Barcode Software), high quality barcodes can be created easily. This application is available free for users of ConnectCode Barcode Software. ConnectCode Barcode Software is installed. ConnectCode Barcode Software is available on the Mac App Store. After installing the software, setup the Open Type Fonts as described in https://www.connectcode.net/macbarcodefontssetup.shtml. ConnectCode Barcode Command is installed. Free download at https://www.connectcode.net/commandlinebarcodemac.shtml. After unzipping the download, copy the “numbersBarcode.scpt” script file and “BarcodeCommand” application to the user home directory (you can find the home directory in Finders –> Places). 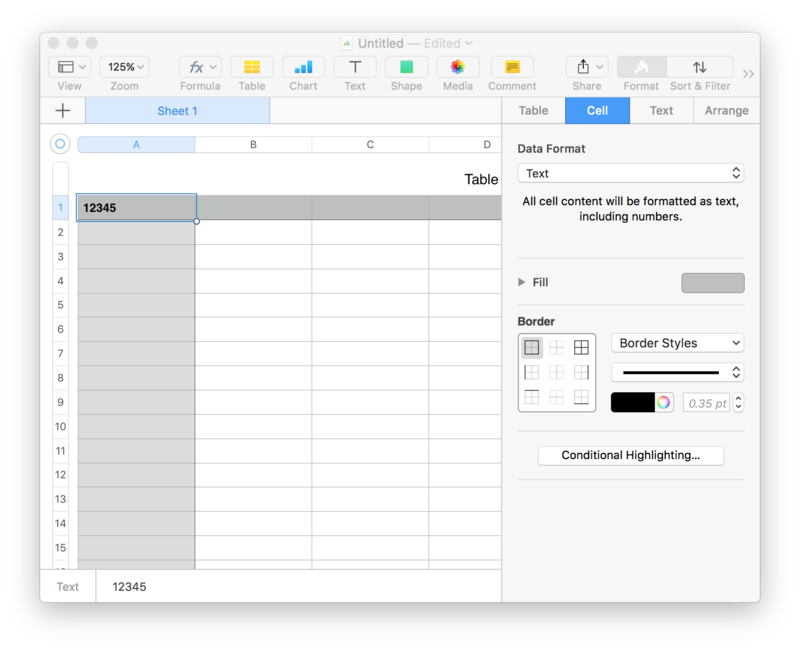 Launch iWork Numbers and create a Blank spreadsheet. 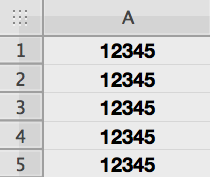 In cell A1, enter the value “12345”. Click on the menu View->Show Inspector. Select the “Cell Format” to be “Text”. Copy cell A1 (Command C) and paste (Command V) it to the next 5 rows as shown below. 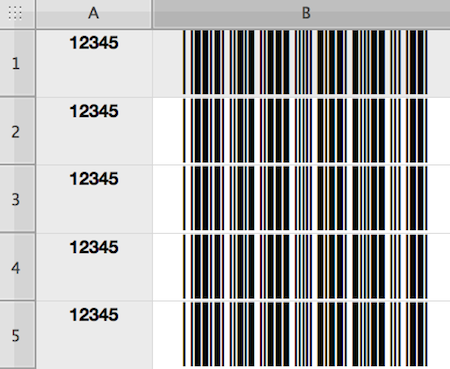 We are going to use AppleScript to create barcodes for these 5 rows of input data. Launch Mac OS Finder and go to the users home directory. Ensure that the “BarcodeCommand” and “numbersBarcode” files are in this directory as specified in the prerequisite section. Double click on the “numbersBarcode” file. The AppleScript editor will be automatically launched to display the contents of the file. Click on the “Run” button to execute the script. 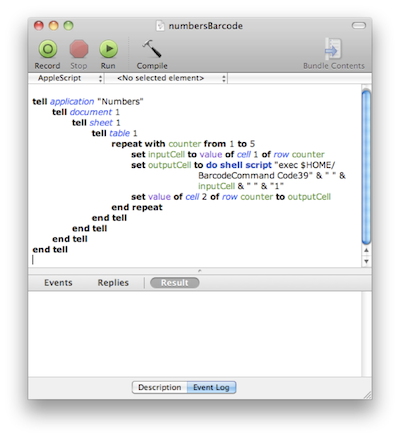 The “numbersBarcode” file is an AppleScript file that will execute the “BarcodeCommand” command line application (located in the user home directory) to convert the inputs in the first 5 rows of “table 1” in iWork numbers to Code 39 barcode output. The details on how to customize “BarcodeCommand” to create different types of barcodes are described in https://www.connectcode.net/commandlinebarcodemac.shtml. The output of the script will be placed in column “B” of the Numbers spreadsheet as shown below. The final step involves changing the font of the barcode output in column B. Select cell B1 to cell B5 and click on the menu Format->Fonts->Show Fonts. In the Font dialog, select the “CCode39_S3” as the font family and “24” as the font size. You have successfully created a list of industry compliant Code 39 barcodes. The “numbersBarcode” script can be easily customized to create different types of barcodes or for different rows/columns in iWork Numbers.